I skipped Expedition July for the We35 Project in which we were tasked to convey an Emotion in a photograph. I had an idea, executed it half-heartedly, and in a strange bout of good judgment decided it was better left unused. Recently, it has become clear that it’s OK to go back and fill in any Expeditions we missed. Plus we did not get the October assignment until November. So I thought about re-visiting my July concept. 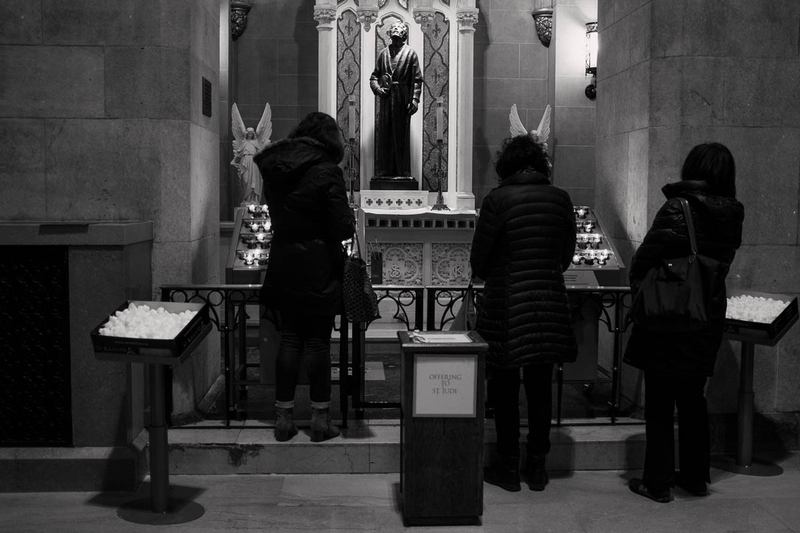 Then I found myself in St. Patrick’s Cathedral last week and saw the devoted praying at the altar to St. Jude and I revised my concept on the spot. I have been fascinated with the idea of Hope as a virtue for some time now. It always seemed an odd choice for one of the three big Christian virtues of Faith, Hope, and Charity. Hope seems easy, and even insubstantial. You might hope it doesn’t rain this weekend, or that a favorite team wins. Hope can also be for more important items, such as the hope that our families will be safe, healthy, and happy. But that’s still easy, and hardly seems particularly virtuous. Hope does hurt, terribly. But no one in my circumstances would choose the wheelchair and the pain medications over even a small chance at health. I wonder, though, how often I have made that same unimaginably shortsighted choice: not to hope, and so not to feel the sting of the joy I lack. A life lived in search of that joy is bound to hurt, and the pain will sometimes seem unbearable: worse than the worst a bad back can produce. Still, it is surely a larger and more worthy life than that of Lewis’ dwarfs eating muddy food. Eyes turned upward may sting, for the sun is bright. But those who walk with heads down see little. Better to look up. Saint Jude is commonly known as the Patron Saint of Lost Causes. Tradition holds that he intercedes on behalf of those facing desperate, difficult problems and circumstances. It is a comforting thought, if you believe. Whether or not you do, it is useful to have a point of focus to assist you to find Hope when you most need it. And I sincerely do hope you have something that fulfills that role. Great WE35 addition Mark, Merry Christmas to you and yours!